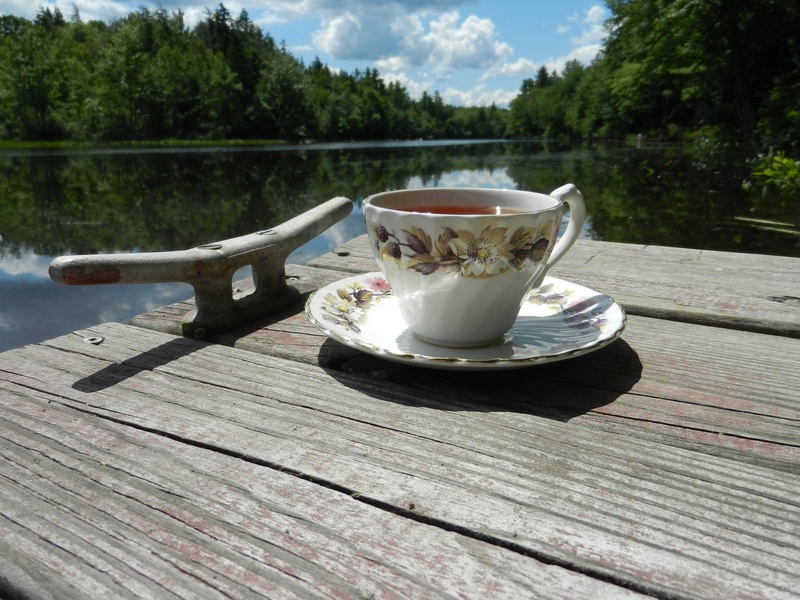 With the humidity finally breaking, I enjoyed a wonderfully, serene tea down on the dock. My (badly) hand-painted, black wooden tray served as the base for some Scottish breakfast tea in my Tain pottery teapot. Then I mixed it up (I’m such a rebel!) and used the vibrant orange plate that matches the little flower pitcher as my teacup saucer. Blues & oranges. The daisies and Heliopolis are just starting to bloom in my garden and made a lovely, simple bouquet. What a perfect spot for tea today, Heidi. As the heat continues, it would be delightful to have tea on the dock and then slide gently (I wouldn’t jump or dive!) into the water and float around on an inner tube.